Editor Tehani is in very excellent company in the SF Mind Meld asking the question “The books that made us love science fiction and fantasy” (and is super excited to be part of her first Mind Meld!). Stephanie Gunn reviewed Insert Title Here for the Australian Women Writers Challenge 2015 (not all the contributors are women, or Australian, but we appreciate her including it!). Stephanie says she “loved the darkness of this anthology … and all of the stories were worthwhile reading” and “…this is an extremely strong collection. The stories are varied, and I suspect that most readers will find at least one or two which speaks to them. Highly recommended.” Cheers Stephanie! 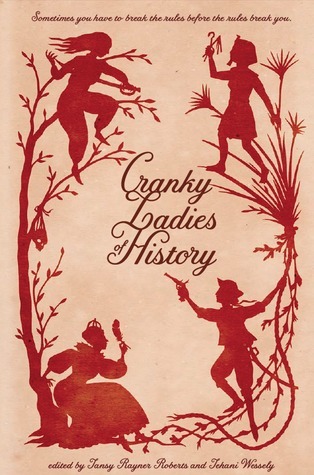 Ju at The Conversationalist comprehensively reviewed Cranky Ladies of History and notes: This book is both a pleasure to read, and gives you some small insight into the historical significance of several women, mostly those who are forgotten by modern history. It’s not that the book is educational exactly, but it does make you want to learn more, to study these women and their lives. A different Stephanie reviewed Phantazein a while ago, over at the No Award blog, noting that it “expands beyond Western fairytales” and is a “fun read”. Thanks Steph! Delighted to see stories from Phantazein in Ellen Datlow’s Best Horror of the Year Recommended Reading list, including Faith Mudge’s “Twelve” and Suzanne J Willis’s “Rag and Bone Heart”. Several other Aussies and plenty of great company on that list too! Angela Slatter is interviewing the contributors to Focus 2014 over at her blog. Check them out here. Alex Pierce includes some FableCroft news in her latest Aurora Australis column at Tor.com. This entry was posted in Reviews and tagged Cranky Ladies of History, Focus 2014, giveaway, goodreads, Insert Title Here, Phantazein, reviews. Bookmark the permalink.